Jenny Marketou, is a new media artist born in Athens, Greece, who lives in New York City. Her work in video, video installations, digital media, performance, photography and public dialog investigates the relationship between public and private ,access and control in our cultural landscape. Her work has been shown internationally including the Sao Paulo Biennial in Brazil; Venice Biennial in Venice ; Les Rencontres Internationales Centre Pompidou in Paris ;Theater Platz and Kunstalle Basel ,Switzerland; E:vent Gallery in London; Anita Beckers Gallery in Frankfurt,; LOOP Video Art 07 in Barcelona,; ZKM, Centre for Art and New Media in Karlsruhe, Germany; Eyebeam in New York; Reina Sofia, Museum of Contemporary Art in Madrid; The Rose Art Museum, Brandeis University, Boston; Sammlung Essl in Vienna; The Queens Museum in New York among other venues. He projects have been commissioned by PULSE New York City, Shift Festival in Basel, Switzerland: Laboral, Centre for the Arts and Creative Industries, Gijon Asturias ,Spain; Cornerhouse and Futuresonic in Manchester,UK; ZeroOne/ISEA 06 in San Jose, California; The Black Box/ARCO 06, in Madrid, Spain. She has been awarded grants and artists residencies worldwide and holds a Master of Fine Arts from Pratt Institute in Brooklyn, New York. She taught as an adjunct professor Photography and Interdisciplinary studio art at The Cooper Union School of Art and Science in New York City. She is the author of the book with photographs and interviews " The Great Longing: The Greeks of Astoria, Queens". - NEXT Art Fair Chicago ,Anita Beckers Gallery, Chicago,ILL. 2008: Fear of Feat Itself /Surveillance Society, Jenny Marketou with Alexander Mc Spadden, DAMno , Design, Art and Architecture Magazine No 15, March 2008. - 2007: Katerina Gregos, Hellenic Contemporary, Flash Art, The World?s Leading Art Magazine, International, Vol.XL.No.256 Oct. 2007. 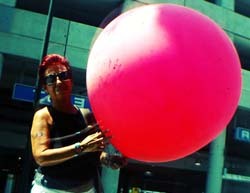 - 2007: Milagros Bello, ?The New Media Festival, Second Edition,? Wynwood: The Art Magazine, Miami, New York, US, International. Vol. 1, No. 2, Oct. 2007. - 2007: Christiane Paul, FeedBack, Laboral Centre for Arts and Creative Industries, Gijon, Asturias, Spain. - 2006:"Shakespeare + POP Star= A great game." - 2006: ? Take you by Storm? an interview with Jenny Marketou and Small World Podcast. - 2005-2006: Michael Rush, ?Power and Control: Surveillance and Performance in Video Art,? Krannert Art Museum, Urbana, Illinois and The Rose Art Museum, Boston, Mass. - 2005: Amanda Beattie, ?Displacing Identity and Privacy: An Analysis of Jenny Marketou?s? Translocal Camp in my Tent,? essay, Montreal, Canada.